So...I think I'm selling candles now...check it out! I know, I know...it's been a while. I'm just not sure what's up with me. I still like to cook; I definitely still like to eat. I certainly miss interacting with all my nice blogger friends. I'm just lacking something. Some spark; some driving force. But I'm certainly not going to beat myself up about it. I'm told I need to eat less protein, some small kidney issue. Is there protein in blueberries? I hope not! I love love love blueberries, but they can be just so expensive. 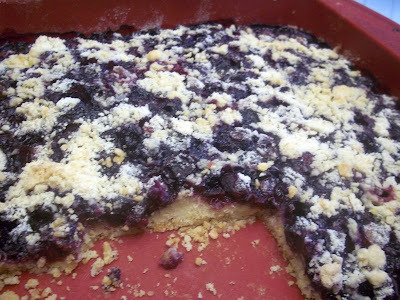 But I splurged today so I could make these delicious shortbread bars for me and my berry-loving son. These are perfect...not too sweet. 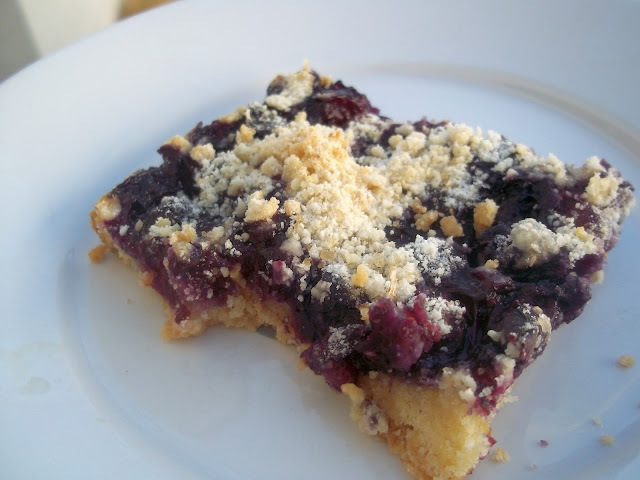 Really lets the blueberries shine. The recipe calls for chinese five spice, which seemed a bit odd to me. So I just used nutmeg and added some lemon zest to the dough. 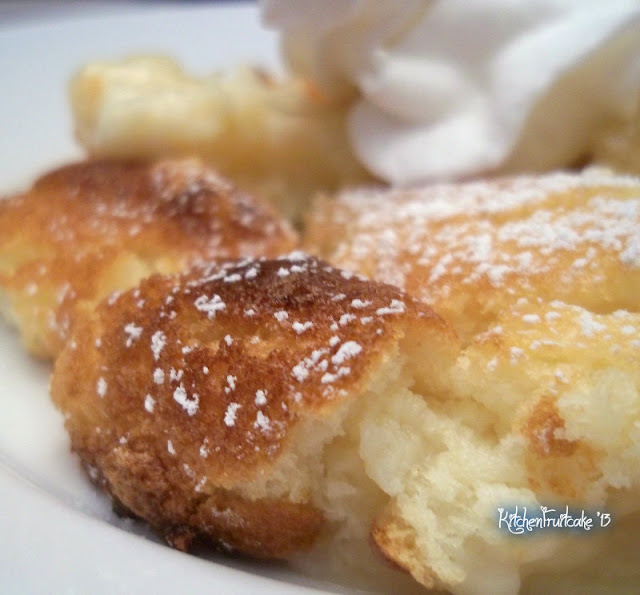 These are perfect with a big glass of iced tea. 1. Preheat oven to 375 degrees F (190 degrees C). Place butter cubes in the freezer for 15 minutes. 2. Whisk together flour, sugar, salt, and baking powder in a large bowl. Sprinkle in Chinese five-spice powder. 3. Cut in frozen butter using a pastry cutter until the butter pieces are about the size of peas. Mix in egg yolk and continue cutting in until thoroughly combined. Drizzle in ice water and stir to combine. The dough should just come together when pinched between your fingers. 4. Pour about 3/4 of the crumb mixture into an ungreased 9x9-inch baking dish. Press the mixture down firmly using the back of a spoon. Spread blueberries in one layer and sprinkle with remaining crumbly dough. 5. Bake in the preheated oven until the top is golden and sides are crisp and browned, 30 to 35 minutes. Cool completely before serving. So, what's been going on with all of you? My son graduated eight grade yesterday...on to high school, wow! My daughter made it through 6th grade, although it was quite a struggle sometimes. (I have to sing "just keep swimming" in my head quite a bit!) Planning a couple of camping trips in this summer, and recently celebrated my 16th anniversary in the crazy little town of Jerome, Arizona. The whole family approves...I think I've made it 2 or 3 times in the past couple of weeks. You could absolutely leave off the feta, but it's really nice on there. Butter a large baking pan or dish and set aside. 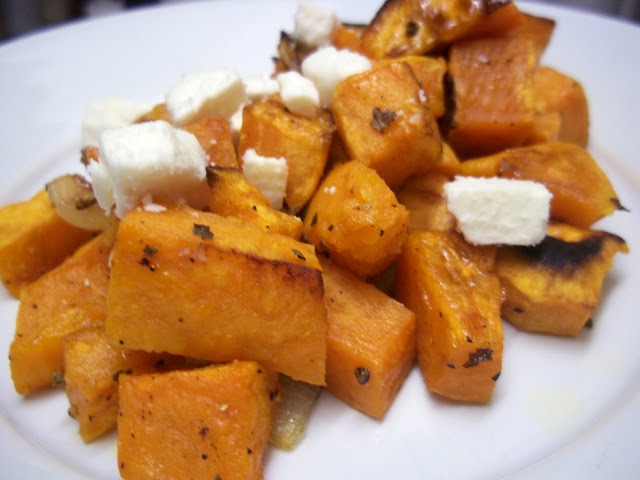 Add the chopped sweet potatoes, onions, and olive oil in a bowl and mix. Season with salt, pepper, and oregano; mix together and place the sweet potatoes on prepared baking dish in a single layer. 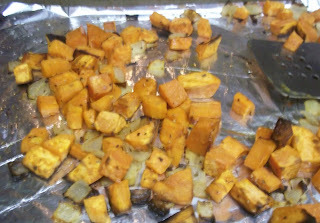 Roast for 20 to 25 minutes, stirring once halfway through cooking, and cook until potatoes are fork tender. 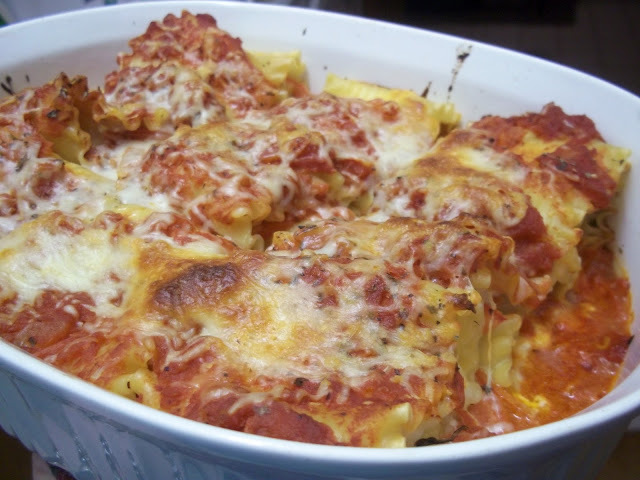 I love all things lasagna, in just about any shape or form. And this version proved to be wonderfully delicious. I always like finding dinner ideas that don't have meat in them, and I didn't hear any complaints about it at all. I had to skimp on the basil a bit because when I went outside to get the basil, I found that the frost had gotten it..darn it all! But it was still quite flavorful, and I loved the homemade marinara that goes with it. And that broccoli sitting all innocent-like over that is Ina Garten's roasted broccoli. If you've never tried her version do yourself a favor and do so as soon as possible. Makes me eat broccoli like I'm popping m&m's...seriously! So, I've been having hip pain...quite a bit. I ignored it/dealt with it for almost a year but finally decided to mention it to the doc. He suggests I may be carrying a bit too much weight around on my aging joints (no way!). So it pleases me to find a recipe such as this that brings a big a whole lot of deliciousness with a bit less naughtiness. 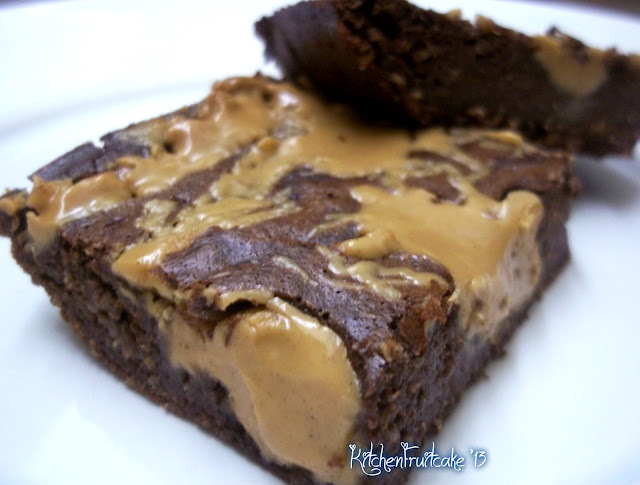 These brownie were SO easy to make, and really delicious. In fact my daughter set aside 3 pieces to take to school and share with her friends. I like that there is no flour and no oil in them either. Here's the recipe...hope you get the chance to make them. 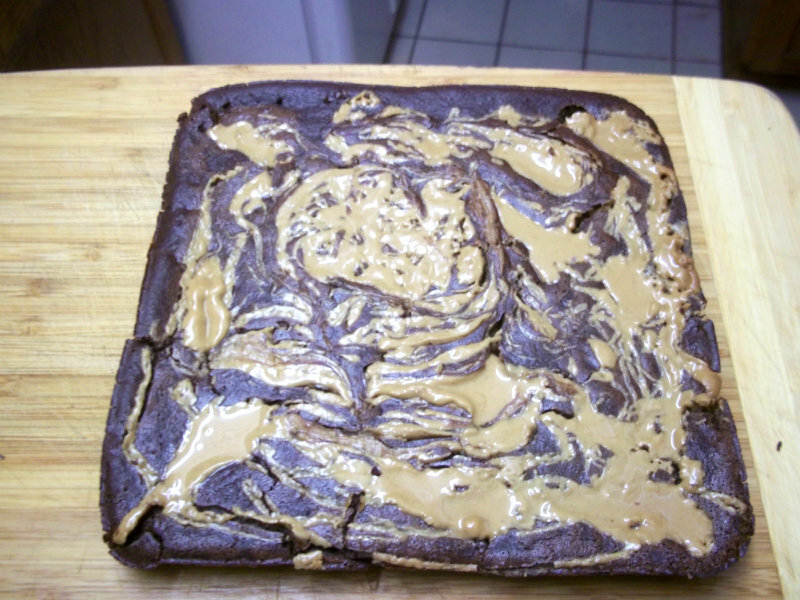 Bake for 20-25 minutes or until brownies begin to pull away from the sides of the pan. Brownies will be extra fudgy, so be sure to wait until COMPLETELY cooled. So, are you tired of winter? Are you ready for Jack Frost to take a long walk off a short pier? Then make yourself a big ol' batch of this lemon pudding and pretend that the sun is smiling down on you. Personally I'm not sick of winter at all. But I'm in Phoenix and I'm tickled it will be 29 tonight! 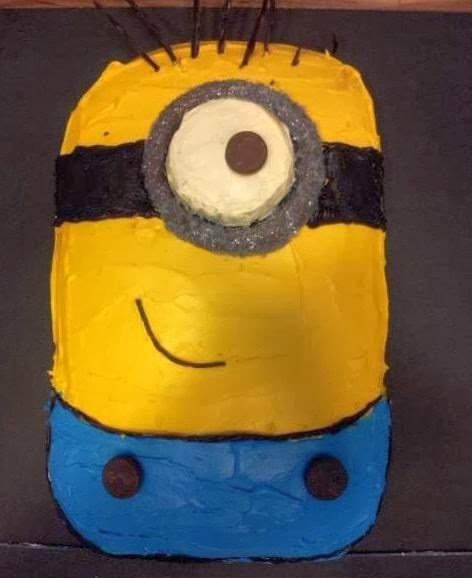 I saw this treasure while perusing Pinterest, and added it to my to do list. Since my friend gave me 2 lemons on Sunday, I knew it was meant to be. It has a very simple ingredient list, and I have no idea why it's "Irish". There is no whisky or leprechauns in it. Here is the recipe found at The Baker Upstairs. She doubles her recipe and puts it in a springform pan so it will be pretty. I'm way too lazy for that, so I just put it in a casserole dish.